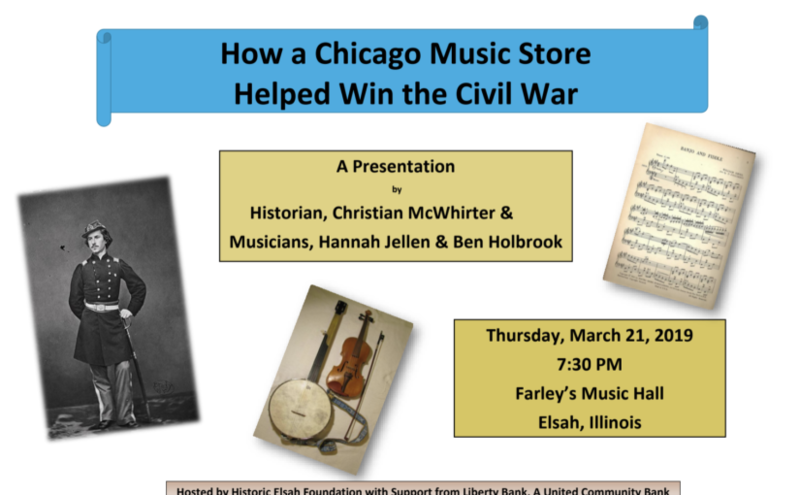 Come listen to Civil War songs and learn “How a Chicago Music Store Helped Win the Civil War,” on Thursday, March 21, at 7:30 pm, at Farley Music Hall, Elsah, Illinois. Lincoln Historian, Christian McWhirter, from the Abraham Lincoln Presidential Library and Museum, Edwardsville fiddler, Hannah Jellen, and banjo player, Ben Holbrook, will perform and explain how popular songs such as “The Battle Cry of Freedom” and “Marching through Georgia,” provided high-spirited entertainment for soldiers at the battlefront and folks on the home front during the Civil War. These and many other popular songs about the Civil War were published by Root and Cady, a new but enormously successful music store and publishing company in Chicago. The firm’s founders, Ebenezer Towner Root and Chauncey Marvin Cady dominated Chicago’s music publishing industry until the Great Chicago Fire of 1871 destroyed the firm’s all paper (nothing was digitized on the cloud) inventory, leading to bankruptcy. But the songs survived, Dr. McWhirter, has written about them in his book, Battle Hymns: The Power and Popularity of Music in the Civil War. His research has shown how the popular music of the war played in effectively endorsing emancipation for African Americans and in their being recruited into the Army. 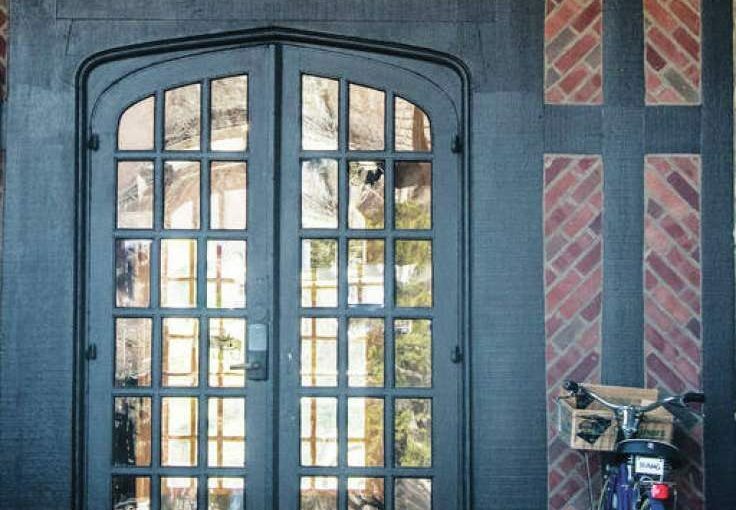 Historic Elsah Foundation celebrates, educates, and preserves the buildings in Village of Elsah. 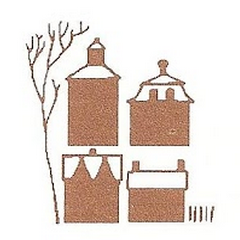 You may join Historic Elsah Foundation as a member at any time. In 2019, a Youth Prize will be added to the Village of Elsah Museum’s popular annual photography exhibit. This year’s theme is “Joy and Discovery in Elsah.” The Youth Section of the exhibit is for photographers between 12 and 18 years old. The exhibit section seeks to provide an opportunity for young photographers to share and evaluate their works with their contemporaries. A $100 prize is provided for the winner of the Youth Section. The prize is chosen by an outside judge. In addition to the Youth Section Prize, the Village of Elsah Museum will provide a workshop for young photographers to learn about photography and participating in an exhibit. The workshop will be conducted by Marty McKay (2018 Greatriverroad.com Purchase Prize winner) and Karen King (2013 Village of Elsah Purchase Prize winner). Both McKay and King have previously led photography workshops for young people. The workshop is on Saturday, February 16, 2019 at Farley Music Hall, 37 Mill Street, Elsah, Illinois starting at 10:00am and finishing by noon. Participants are to be between 12 and 18 years old. The workshop enrollment is limited to 20. Registration is required prior to the event. Contact for details on registering: historicelsah@gmail.com. Photography submission rules are provided at this url: www.escapetoelsah.com/photography-contest. There is no charge for this workshop. This workshop is sponsored by Village of Elsah Museum and Historic Elsah Foundation. The workshop will open with a brief review of some of the basics of photography and participating in the Village of Elsah Museum exhibit. Then, McKay and King will take the participants in two groups for an on-location photographing session in the Elsah valley. The last portion of the workshop will include a critique and will help the participants ready their images for printing. It is the goal of the workshop to help the participants have, at least, one “ready to print” image for later submission before or by the exhibit submission deadline of Monday, March 18, 2019. Office Depot located at 300 E Homer Adams Parkway in Alton has graciously agreed to provide printing services for the youth workshop participants to facilitate their submissions to the Village of Elsah Museum Photography Exhibit, Youth Section. One 8 x 10 photo will be printed free of charge. This will ensure each participant in the photography workshop will have, at least, one photo to enter. The organizers of the photography workshop will help the participants pick a photo and will arrange for the printing with Office Depot. Individuals must make their own submission. Thank you to Office Depot (and staff member, Cat) for providing this service for the workshop participants. Workshop participants should bring their camera; and wear warm and appropriate clothing for on-location work, and bring their enthusiasm. All skill and knowledge levels are welcome. 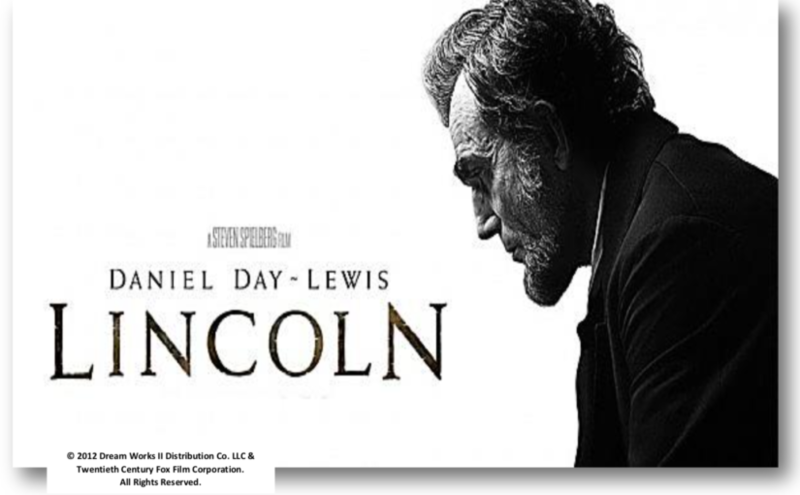 See and hear how historians at the Abraham Lincoln Presidential Library and Museum assisted Hollywood in making the 2012 blockbuster film, Lincoln, on Thursday, September 20, at 7:30 pm, at Farley’s Music Hall, Elsah, Illinois. Ian Patrick Hunt, Chief of Acquisitions, ALPLM, will present clips from the acclaimed movie together with explanations of how he and others at the Springfield Museum helped Academy Award winning actor, Daniel Day-Lewis, Pulitzer Prize author, Doris Kearns Goodwin, and Lincoln producer of Kathleen Kennedy achieve historic accuracy and authenticity in the Steven Spielberg film about the 16th President of the United States. The movie, which depicts the intense political fight to pass the 13th Amendment to the Constitution, ending slavery in the U.S., is based on Goodwin’s 2005 book, Team of Rivals: The Political Genius of Abraham Lincoln. 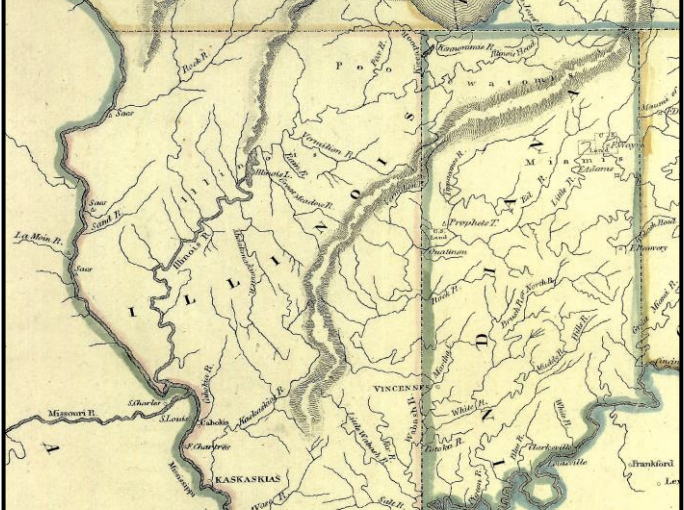 Ian Hunt has advised on numerous publications, television programs and movies about the Civil War and Abraham Lincoln. He is also a consultant too the U.S. State Department Public Diplomacy Program.